It is 7:00 AM and I am so comfortable. The antique bed holds me in its arms and refuses to let me go. The sun slants in my window tickling me awake. From the edges of my consciousness I hear the sounds of the church bells reminding the faithful that it is time to get up and come to the church in the piazza. It is time come together to start a new day. With my eyes still closed I smile because I am waking up knowing I am still in Italy. The weather is warm and moist in my village, just up the hill from the seaside town of Scalea. I toss on a light dress and head up to the piazza. I sit at a table just outside the little bar while the owner brings me a cappuccino and a freshly baked croissant filled with sweet cream, still warm from the oven. The people buzz in and out of the bar tossing back bitter, black espresso and shouting to each other as they head off to work. The lady who owns the flower shop across the piazza opens her doors and brings out her flowers. She stops and smiles, and we wave. Seven years ago, my husband and I purchased a house on the top floor of an ancient building in the hilltop town of Santa Domenica Talao, Calabria, Italy. After a short visit we decided that this is where we wanted to spend our best years. We wanted to wake up to the church bells, gaze at the sea from our balcony and laugh as the swifts dip, dive and buzz our heads. When travel guidebooks talk of Italy, they rhapsodize about the regions north of Naples. They completely ignore the South of Italy and in doing so, do a grave disservice to their readers. There are so many reasons that Calabria is the dream destination not only for travelers but also for expats. It is tough to list just a few. Southern Italy traditionally was considered the poor region. While this was true before the 1950’s it is not true now. Nonetheless, the prices are ridiculously inexpensive compared to Rome or anywhere in Tuscany. A cappuccino in Rome costs about three euros whereas a cappuccino and pastry costs one euro thirty in my village. Hotel accommodations are almost half what you would pay for similar accommodations further north. Most mornings I visit my friend Nunzia who owns the store in the piazza. Parked nearby is an ape, the little three wheeled truck that is ubiquitous in Italy. It is filled with whatever produce is leftover from family farms for Nunzia to sell. Today it is peaches, still fresh and fragrant with their leaves still clinging to them. Tomorrow it will be tomatoes as big as your head, sweet and juicy from the Calabrian sun. Every Tuesday the fish man comes through the village with his loudspeaker announcing the fresh catch of the morning. Your dinner has just been pulled from the Mediterranean. Olive oil is a staple and the Mediterranean diet has been touted as one of the healthiest diets one could adopt. Italy as a country ranks among the highest for longevity. When my husband and I first arrived in our village we must have been a sight. I am a tall blonde lady with wildly curly hair. My husband is of Northern European descent. In short, we are very different than the average villager. Nonetheless we are accepted with open arms by everyone. Our village is a giant family, I witnessed this one night as Nunzia and I took the passagiata (the evening walk). We stopped and kissed all the babies. We chatted with neighbors. We celebrated their joys and mourned their losses. Throughout the piazza women walked arm in arm. Men played cards at tables outside the bar and everyone belonged. They are part of something bigger than just themselves or their nuclear families. They are part of the village. I truly believe that the absence of mental health issues in our village stems from this vital fact. They all belong and everyone is loved and accepted, even a lanky blonde with faulty Italian. Calabrian cooking is becoming famous. Most Italian food you enjoy in the US has its roots in Calabria. Many Calabrians came to America in the late 1800’s and early 1900’s bringing their recipes with them. 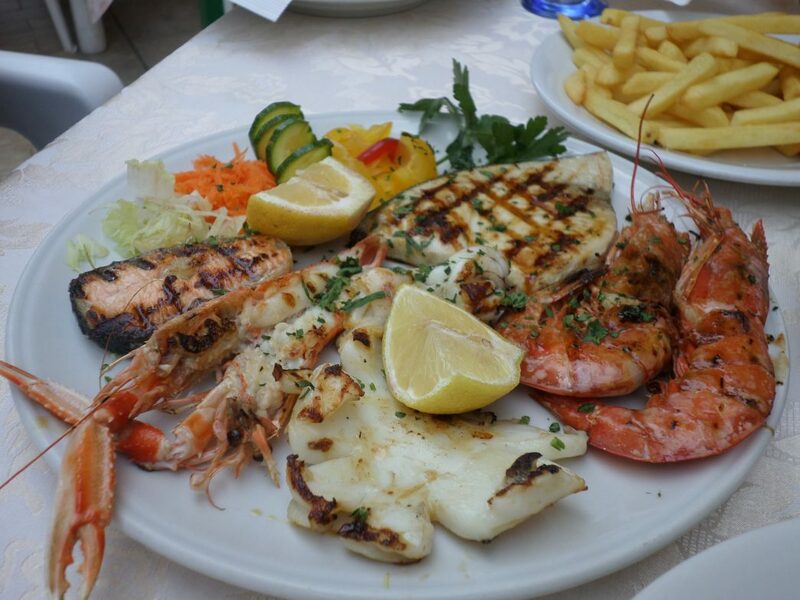 Since we are right next to the Mediterranean, seafood is king. Tiny anchovies dressed in lemon grace our plates while calamari, fried with impossibly light breadcrumbs, come next. Octopus, swordfish, cuttlefish, giant prawns, clams and other shellfish are plentiful. Most of the restaurants in the hill towns serve house made products. 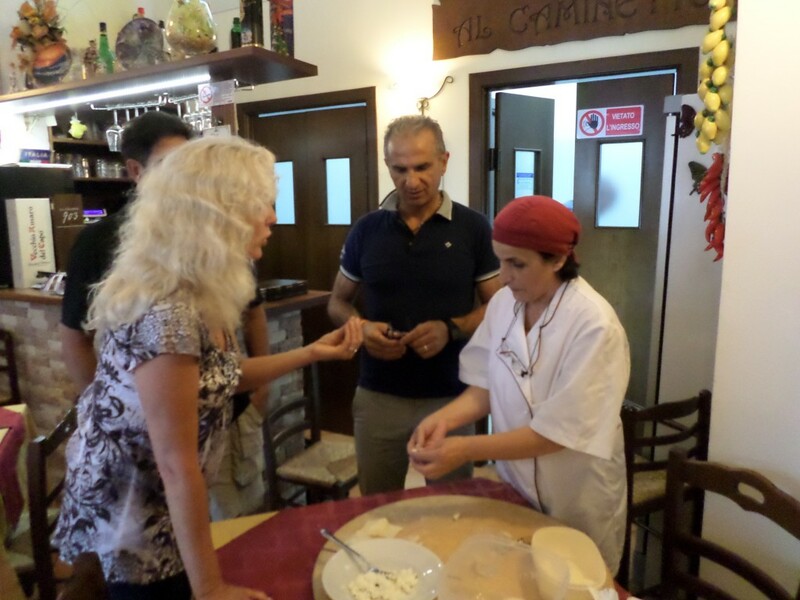 The pasta is hand made, the sauces are crafted from old family recipes and the bread is as fresh as it can be, having come out of the oven that morning. 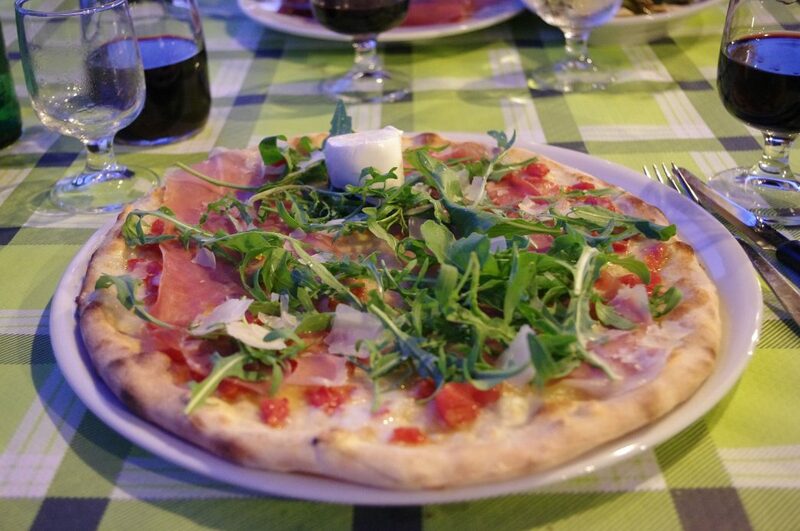 Traditional pizzas are baked in brick ovens and topped with a perfect sphere of mozzerella di bufula. Most of the wines in Calabrian restaurants are locally created. Calabria is known as the Mezzogiorno or the “midday” region. The sun shines most of the year and the mix of sea air, bright sunshine and rich soil seems to be the perfect environment for wine grapes. The wine is light enough to avoid interfering with the cuisine and you taste the fruit rather than just the alcohol. It pairs perfectly with Calabrian specialties. It’s rare to see a Calabrian rushing off somewhere. The pace of life is softer and gentler than I am used to. The focus in life is life. The joys and sorrows, the family times together and views of the sea are vital to my neighbors. Work gets done but it is given its proper importance. Calabria is home to miles upon miles of the most beautiful beaches on the planet. The stretch of seaside from Scalea down to Reggio Calabria boasts of stunning beaches and picturesque seaside fishing villages. Looking inland you see the dramatic, jutting mountains that turn from pink in the morning to grey to purple as the day progresses. The mountain ridges carry tiny hill towns on their backs while little farm houses dot the fields below. My favorite pastime is sitting at the restaurant at the edge of my village, gazing at the 360 degree view first of the mountains, then the sun setting over the Mediterranean and finally the village glowing gold and looking so much like a fairyland that you have to look twice. 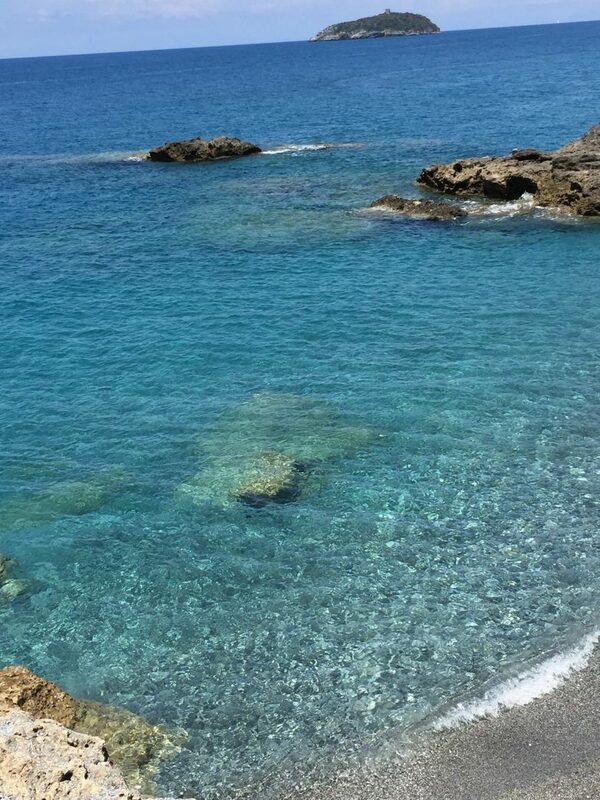 Everywhere you look in Calabria there is something jaw droppingly beautiful. The sea is crystal blue and warm, magnificent art and architecture are everywhere, and the people, so willing to smile and hug you are the most beautiful sight of all. Calabria is home to some of the toughest and yet most warm and loving people I have ever met. Not so long ago, these people eked out a living from farms and the sea. They withstood the horrors of two world wars, and yet when you approach them, they smile. It is so easy to make friends. There are several expats in our village. We all get along and we all fit into this little village of disparate personalities and backgrounds. A short trip south on the train is Lemezia Terme airport. From there you can catch cheap flights to anywhere in Europe, Africa, the Middle East and Eastern Europe. From Santa Domenica Talao you can drive east to Bari, Puglia and take a ferry to Greece. Or you can drive south to Reggio Calabria and take the ferry across the Straits of Messina and over to Sicily. The travel possibilities are endless. And we want to share this idyllic life with everyone we know. Book your flight and head over. You too can wake up to the church bells and enjoy the healthy and beautiful Italian lifestyle. Your best years are ahead of you. Give yourself the gift of Calabria. You will never want to leave. Call us. We can help you plan the perfect trip. Don’t miss this perfect destination. I’m sold! Italy has a special place in my heart…although I haven’t yet spent time south of Rome. I’ve another few years before retirment, but you’ve inspired me to put Calabria on my list. There’s such a tighter sense of community in Europe I think and the pace of life is much better suited to our golden years as well. Thanks for sharing. You’ve captured exactly what’s special about the sense of community in Europe, and that’s what we really appreciate about our village where we purchased our apartment a few years ago. In fact, a friend of ours recently made the move to our village, along with her sister, where they both plan to spend the rest of their “golden years”. We’ll be interviewing them about this experience when we visit Italy in June, so keep your eyes out here for that interview and their thoughts about living in Italy! You are so welcome! So many people are finding that the elusive “What’s missing?” in their lives is fulfilled here in Italy and especially in Calabria. There is nothing like being part of a village with all its joys and sorrows and new babies and celebrations. All my life I felt that “something missing” feeling and when I arrive in Italy it is gone. Even if your retirement is years away, do come! Let me know and we will roll out the red carpet! It sounds wonderful. Your love for your new community is evident in your words. A great read. I’m glad you enjoyed reading about our new community! Hi Anne! For some reason I am only just now seeing your comment a year later! Thank you for reading! I hope someday to see you in the piazza! Thank you folks for responding! I sincerely hope to see you in Santa Domenica! A great article which persuaded me to settle in Calabria. I love the idea of being able to walk to the village square to buy early fresh, seasonal fruit and drink coffee while people watching. 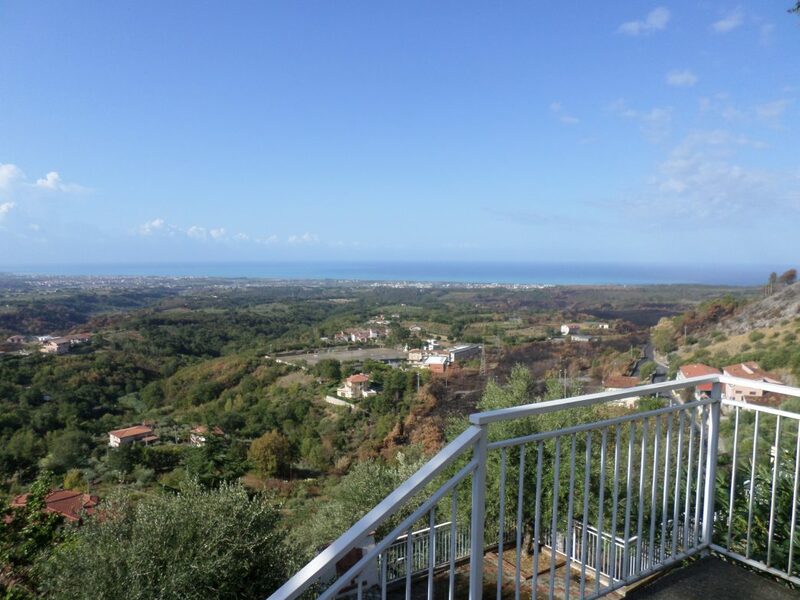 I’m not sure where the best of Calabria is but currently I’m viewing a house 2 k outside Belvedere Marittimo. But there are so many places to look. Any advice you could give on location? Diamante is somewhere I’m thinking of too. How exciting! Belvedere is gorgeous and so is Diamante. It all depends on what your ideal scene is with regard to lifestyle. Each village and hill town has a different character and personality and I believe you have to go there and visit each one to see if you like it. Belvedere has a beautiful old town and I love the old towns the best. It is on a hill overlooking the Mediterranean so you do get sweeping views from up there. Diamante is right on the sea and also very beautiful. It is also more expensive than the hill towns or even Scalea and Praia a Mare. One thing you do have to keep in mind is that every August, the beach resort towns fill up to the brim with tourists. Driving is crazy and there are crowds everywhere. If you choose a hill town above the fray, you won’t have as many tourists. Santa Domenica Talao is a beautiful village (This is where we live) there are several ex pats there and the community LOVES Americans and has welcomed us from the beginning and made us part of their village. If you are looking for something near the sea, Praia a Mare is a stunning little seaside town. And so is San Nicola Arcella. I could go on and on but I think the best thing for you to do is to come over and visit each town and see properties. I can introduce you to Antonello who is the architect of our village and he can show you properties, and Ivan in Scalea is a great agent there and can show you all other properties in the area. They are both very low pressure and happy to help you find your perfect place. Can you send me an email at [email protected] and I can send you whatever info you need? My husband and I have been to Italy twice together, he has been twice before that alone for his Navy Reserve duty. Two years ago I read about Calabria online and saw the beautiful photos of Tropea, Pizzo and San Nicola Arcella and in particular the hidden Arcomagno Beach there, simply stunning! Looks like something you would see in the next Pirates of The Caribbean Film. 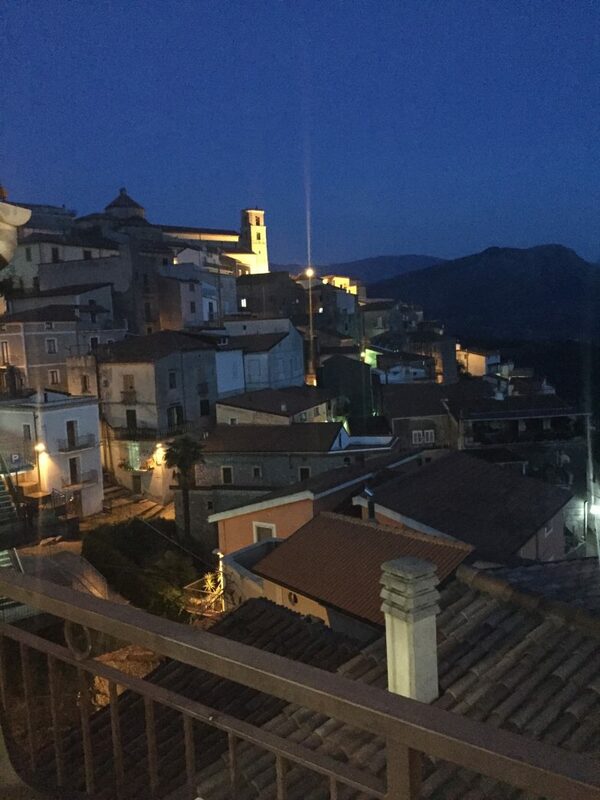 We fell in love with Calabria, with the landscapes, the small towns, the charm and of course the people! Most people we met did not speak much English but we could always find someone who knew some English. We carried a pocket translator with us or used Google Translate if we were stuck. We have since been to Tuscany, Cinque Terre , Umbria and Lombardy(Lake Como). While we loved all of these places, we still felt the pull back to Calabria. We will be going next month for ten days and will be looking at some properties. We are in contact with an agent who works for The Property Organiser, based out of London. They help you to navigate the process of purchasing a home in Italy, they take you to see properties, translate for you, represent you in purchasing and help you navigate how to set up a bank account in Italy. They can also place your property on their rental website. I have been in contact with their company for two years, as we knew at some point we wanted to come back here and purchase a property. 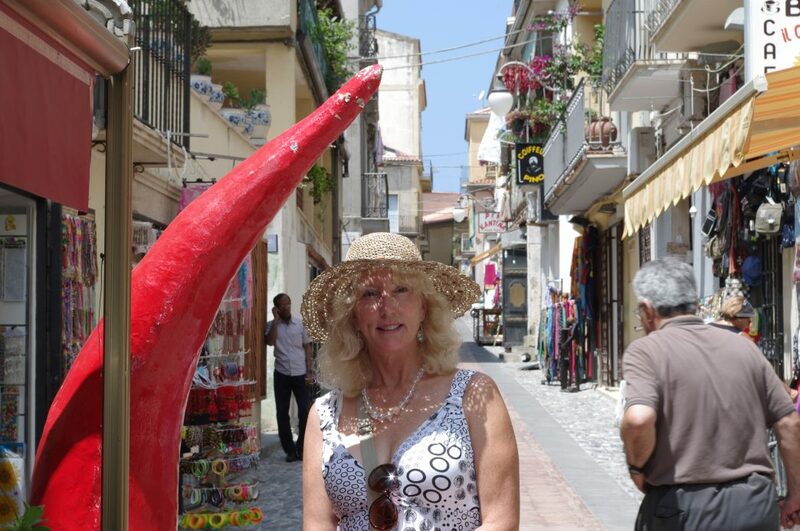 Calabria is very affordable for retirees. You can rent rooms in your home for vacation rental to make extra income, you can also blog about your experience in Italy and make some income through your website. Once we retire, my husband and I plan on coming to Italy for under 6 months and then traveling to other destinations and back to the US for the remainder of the year. We don’t have plans to get citizenship but who knows, that can change at some point. We want to experience life in Italy before we start having too many medical issues and needing body replacement parts! So our plan is to purchase a small place we will visit twice a year for now and then in two more years when our son graduates college, my husband will give his notice to his employer and we will be coming to Italy for a longer term. I don’t see myself ever becoming fluent in Italian at my age but I am sure I can learn enough to get by. 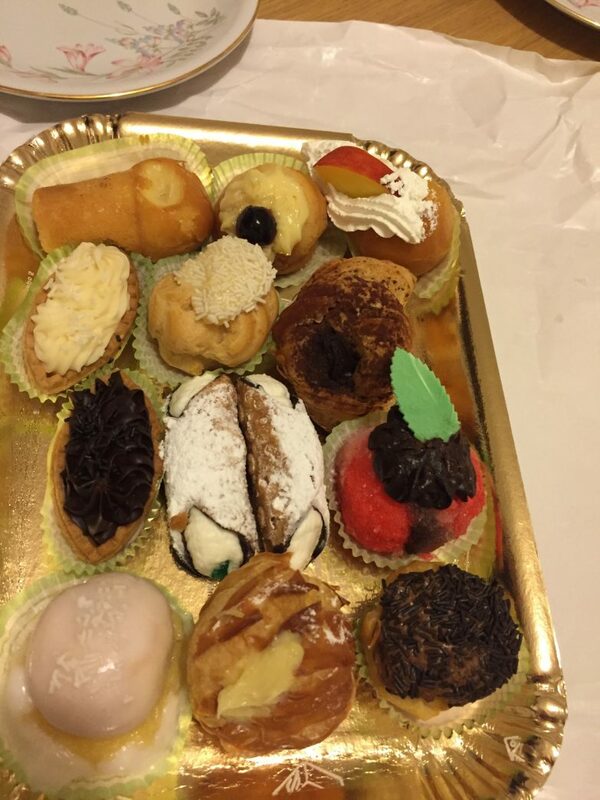 Do you know if there are American ex pat’s in Tropea area or San Nicola Arcella area? I know Santa Domenica Talao is not too far from San Nicola though. Thanks for your informative blog. Hope we can meet sometime when we are in Italy! Thank you for your message here. It is so nice to receive messages from people who love Calabria as much as we do. I am very happy for you that you are getting ready to take the plunge and buy a place there. 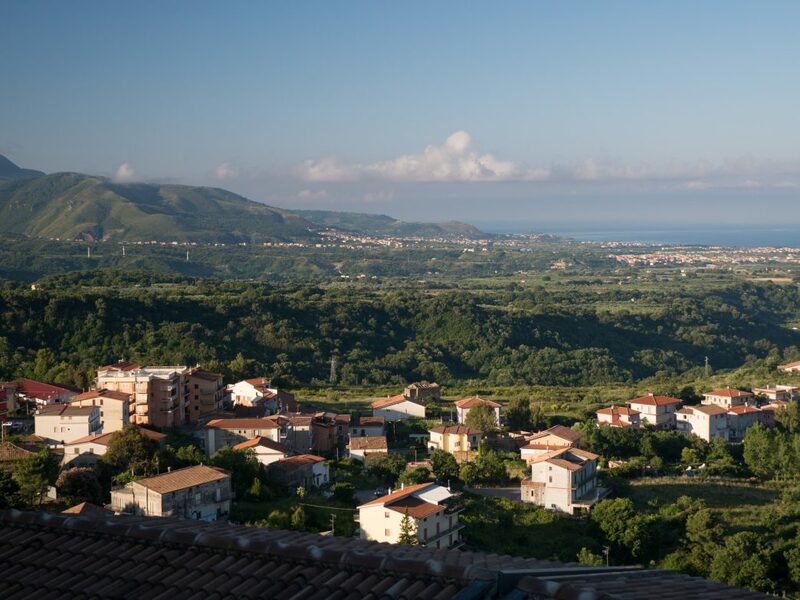 With regard to property purchases, we are very close to Santa Nicola Arcella and the surrounding area (Maratea, Diamante, Scalea, Tortora, Belvedere Marittimo and of course, our village of Santa Domenica Talao). I am happy you have found property agent however being based in England, they may not have the knowledge of the area and a good idea of what the prices should be. The property market has gone very soft for a variety of reasons and it is now a buyer’s market. And sometimes the prices are put up higher for Americans. Hopefully they know this and are aware of the specific markets associated with the specific areas. In Santa Domenica Talao, a friend of mine is looking at properties so I had the opportunity to tour many, many properties with the town architect who took us around. Of all of these properties, very few of them were actually on the Italian equivalent of the multiple listing service and when I told him what we paid for our property through an agent several years ago, there was a long pause on his part. And after seeing the properties available and the real prices it was clear we had paid more than we had to. Our architect (who also happens to be the town historian) has advised me that he would be glad to show properties to anyone who is considering purchasing a home in the village and wants to see them. Our village is approximately 6 kilometers from the sea, up on top of a hill just above Scalea and Santa Maria Del Cedro. It is just South of Santa Maria Arcella. The great thing about being a little removed from the sea is that you get nice sea breezes running through your house and there are fewer mosquitoes in Summer than down below. However the areas close to the beach are very stunning. If you choose to purchase somewhere other than Santa Domenica Talao, I recommend Dr. Ivan Luca in Scalea (https://aziende.virgilio.it/assicurazioni/scalea-cs/assicurazioni-de-luca). He was our interpreter when we bought our house. His English is very good. He also rents out houses for holiday homeowners and pays our bills for us. He can also show you properties for sale in Santa Maria Arcella. This last week he showed us some beautiful properties in Scalea and Praia A Mare that were breathtaking. My favorite was a house in Praia that had been on the market for two years, and is owned by a couple from the Czech Republic. It has a brand new kitchen, 2 bedrooms and a huge wrap around terrace with sweeping views of the sea as well as a private parking space and a huge patio that comes with it. I loved it and it was listed at 69K Euros and was negotiable. That is only one of several properties we saw but it was my favorite. The breezes were so nice there that you rarely have to use the AC which is important because Calabria can get quite hot and humid in July and August. Dr. Ivan has told me that now the notaio can help you set up a bank account for your purchase. The first thing you have to do is go to your embassy and get a codice fiscale which is like an Italian social security number for tax purposes. I would do this as soon as you can so you can be ready to make your purchase. How the purchase works is that you find your property and agree upon a price and terms of the purchase. Then it all goes before the notaio who goes over everything line by line to ensure that everyone is on the same page. You will need an interpreter but Dr. Luca can do this for you as well. As far as ex pats go, there are many Americans, English, Scottish and Russians in Santa Domenica Talao. It is truly an international community and we all come together and fold ourselves into the community and become part of it. 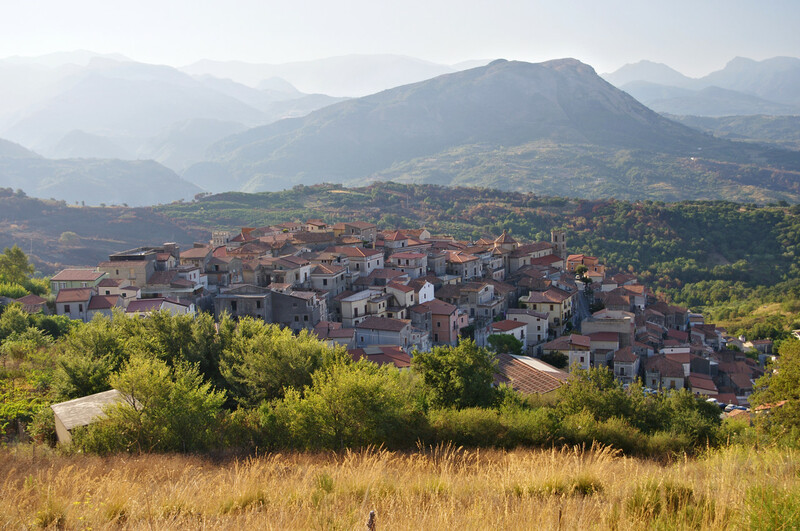 Scalea also has ex pats and we have friends in some of the other villages and resort towns. We have also found that making Italian friends her his so easy that while I was there (I just returned to the states last night) every day was booked for dinners, lunches, tours and various other activities. Regarding learning Italian, it is not hard at all. There is an Italian class in Scalea for non Italian speakers. My friend took these classes and is now very fluent. I have taught myself Italian through different programs including Italian for Dummies and can get around quite respectably. There are several other points you raised in your note. Most of them are addressed in my interview with Bonnie Gale Oliver who recently moved to Santa Domenica and is my neighbor there. As you can see, I could go on for days with advice on this. Please check out they video and let me know if you have any other questions. Please write me back and give me updates on your progress, what you ran into and everything that happens. Your experience will help others who want to do the same thing! I really enjoyed reading about your knowledge and experiences you’ve had since moving to Calabria. My maternal great grandma (my Nonna), lived there ( not sure which town/village), so I’ve always dreamed of visiting and possibly relocating there. Besides that, my mother, 2 sisters and I have been to Florence, Naples, Rome, Venice & the Almafi Coast. 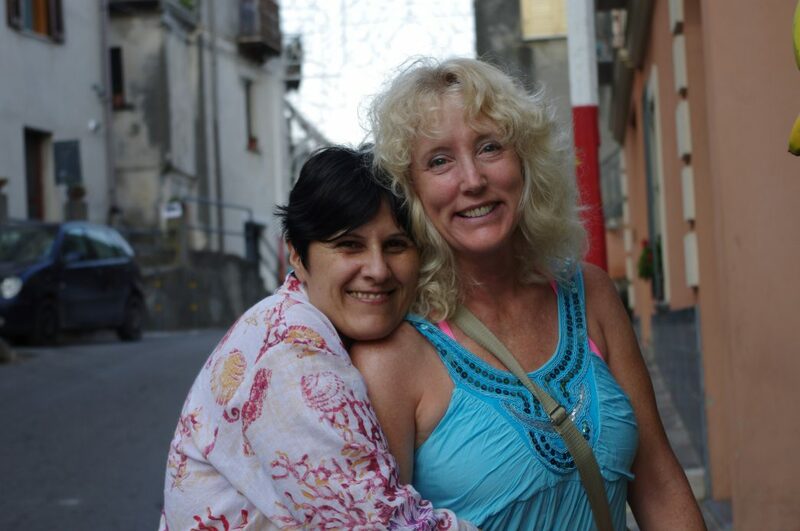 My middle sis and I then spent 4 days in Sicily ( where my paternal grandpa & his family originated, afterwards. We loved the country, people and food. 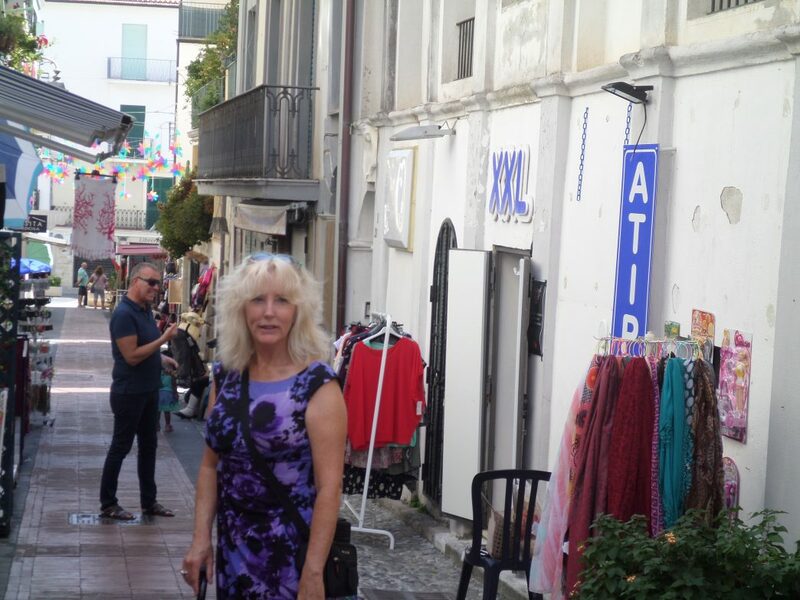 I especially had a warm & fuzzy feeling, it felt like I was “home,” when in Sicily. I do not want to buy a home, but would love to find a small, furnished house or country home to rent long term. But I can’t seem to find any descent rental listings/websites online. Most I’ve found were short term (up to 6 mos), homes with daily rentals (like a hotel would charge), many apartments listed-which I don’t want, or so luxurious and highly priced, that I’m beginning to become quite frustrated. Do you have any recommendations, ideas, know of any websites, contacts, etc., on how I may search for long term home rentals with better success? I won’t be moving immediately, but am very serious about visiting and soon afterwards, relocating there. I would really appreciate your help if you wouldn’t mind, or you can find the time. I know exactly how you feel about feeling like you have come home. I feel that way too. I have a friend who is a real estate agent and he works with rentals. I will send you an email with his contact information and I am sure he can help you. How exciting! 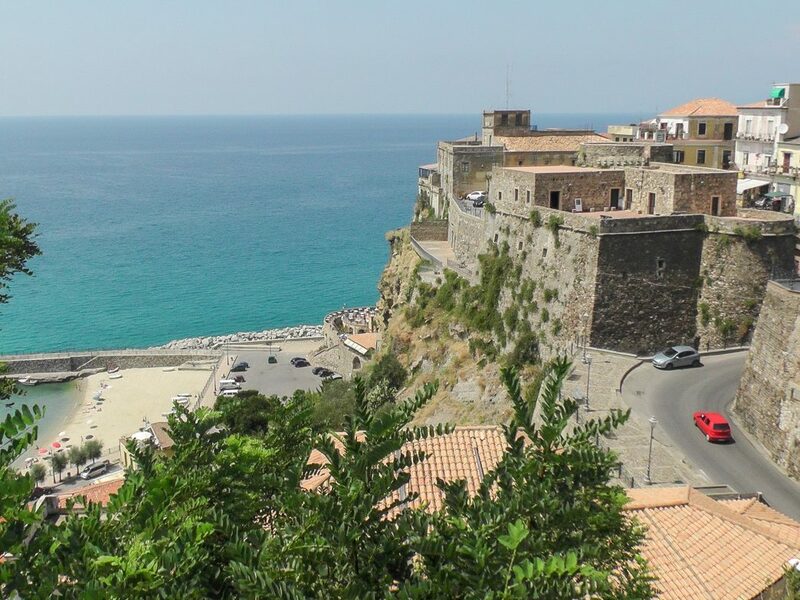 Do you know where in Calabria you want to be? Of course, I recommend our area in and around Santa Domenica Talao but everywhere I have seen in Calabria is beautiful. Look for my email and please let me know when you receive it.